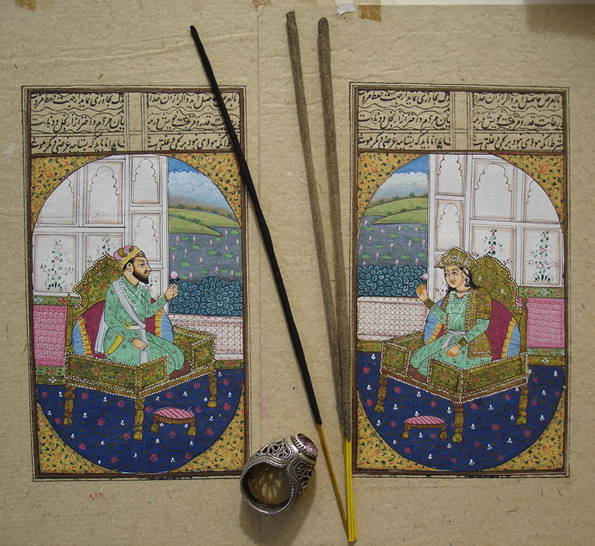 You knew, Shah Jehan, life and youth, wealth and glory, they all drift away in the current of time. You strove, therefore, to perpetuate only the sorrow of your heart…Let the splendor of diamond, pearl, and ruby vanish like the magic shimmer of the rainbow. Only let this one tear-drop, this Tajmahal, glisten spotlessly bright on the cheek of time, forever and ever. – By Rabindranath Tagore (translated by Kshitish Roy) from One Hundred and One Poems by Rabindranath Tagore (pp. 95-96). Shah Jahan (1592-1666), the Mughal Emperor, (sometimes also spelled as Shah Jehan) constructed the mausoleum Taj Mahal for his wife, Arjumand Bano Begum (1593-1631). She is also popularly known as Mumtaz Mahal. Shah Jahan fell in love with her and married her in 1612. After he came to the throne in 1628, he conferred the title, Mumtaz Mahal, on her which means the “Jewel of the Palace” and she was his most favorite wife. She travelled everywhere with him, even during some of his military campaigns. Unfortunately, Mumtaz died when she had their fourteenth child in 1631. 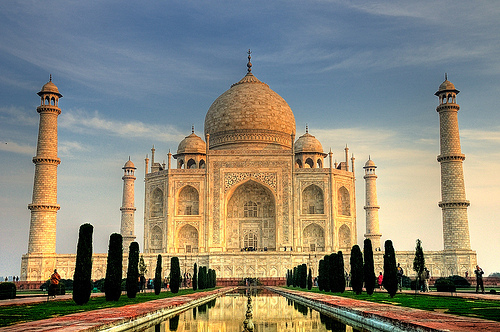 Shah Jahan built Taj Mahal in memory of Mumtaz Mahal as a tribute to their love and to fulfill her last wish. After his death in 1666, his body was buried in a tomb which was located next to his wife’s tomb. If you would like to read fiction based on these historical characters, I recommend you check out Beneath a Marble Sky. Or, if you would like to see some beautiful illustrations from western travelers’ accounts, I suggest a subject search in Catalyst of India — Description and Travel. You will find a good number of the western travel accounts that have some illustrations and/or descriptions of the Taj Mahal. Travelers have always been spellbound by the architectural beauty of the Taj. Taj Mahal means “Crown of Buildings” and it is situated on the banks of the Yamuna River (also spelled as Jamuna) in Agra District, Uttar Pradesh, India. The building has been listed as one of the UNESCO World Heritage sites. The construction of the Taj Mahal began in 1632 and was completed in 1648. During the seventeen years it took to build the mausoleum, approximately twenty thousand workers worked on it, including painters, masons, calligraphers, carvers, dome builders, etc. To embellish the Taj Mahal with beautiful inlay work, 28 kinds of semi-precious as well as precious stones were utilized in decorating the building. 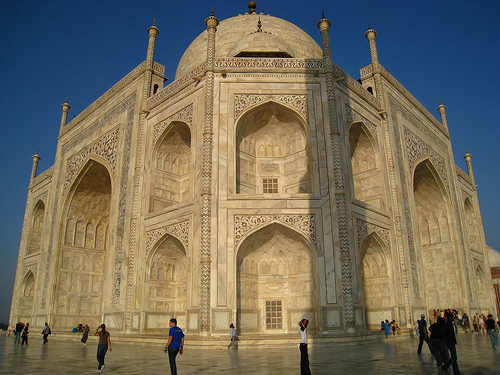 White marble was the main building material and it was brought from the quarries of Makrana in Rajasthan. The Taj Mahal is one of the masterpieces of the Mughal architecture in India. Every year, two to four million tourists visit the monument. Although it is a feast for the eyes to behold the Taj both at sunrise and at sunset, it is particularly recommended that you visit it on a full moon night. I have heard visitors say that the beauty of the mausoleum will mesmerize you and transport you back in time during full moon nights. Ready to book your tickets and pack your bags for the trip? If you can’t leave now, no worries! Experience the virtual tour or watch the National Geographic’s documentary. Where does a poem come from? Thank you for using my father Kshitis Roy’s translation of Tagore’s famous poem. This is very top 10 interesting facts about Taj Mahal because this is one of the most beautiful and popular monuments around the World, which is also listed in seven wonders around the World. Thank you for sharing the 360-degree view of the Taj Mahal, Deborah! 360-degree views of UNESCO World Heritage Sites!